ARE YOU LOOKING FOR THE THERAPIST WHO CAN HELP YOU TRULY FEEL BETTER? Most importantly though, we are interested in YOU. How can our training and experience to help you feel better, move more freely, get out of pain? At Alchemy, we want to know about you so we can provide the comprehensive bodywork that will help you live the life you want. A session that is focused on your needs today, as well as a treatment plan to get you to your long term goals. The connection between client and therapist is where the Alchemy happens. when combined with your inner wisdom and knowings. Shifts, changes, and healing happens, pain leaves, the body is restored. Amelia brings a friendly and compassionate perspective to the subject of interpersonal boundaries. For all of us, boundary challenges are often seen within the family, as well as with friends, professional relationships, and even with strangers. Would you like some insight around why boundaries can be so hard, and how to make it feel a bit easier? Why sometimes it feels so heavy and tiring to be with someone.? How to change things to set up your life to feel more free, comfortable, and supportive? Having, acknowledging, and considering your boundaries is healthy and smart. Join Amelia for what is sure to be an interesting and lively conversation. Catherine will return to continue the discussion of this fascinating and timely topic. The Enteric Nervous System is a vast communication pathway between the belly and all its organs and the brain. New research is providing insights about how this system interacts with our Central Nervous System and whole body, deeply impacting our health and wellness. How is the gut-brain connection impacted by aging? Can we support the health of this system as we age? something ordinary into something precious. 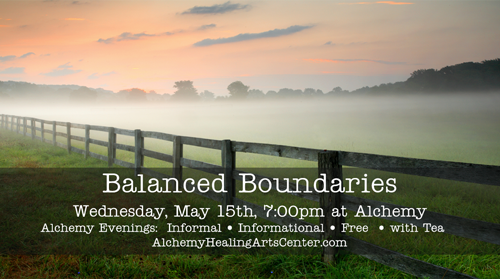 At Alchemy Healing Arts Center, pain, discomfort, stress, and health challenges are transformed. We create a place where deep healing and lifetimes of transformations can and do happen. Welcome to Alchemy.